What is low–carbon economy and how to achieve low-carbon concept in the new CBD in Beijing? A Low-Carbon Economy (LCE) or Low-Fossil-Fuel Economy (LFFE) is a concept that refers to an economy which has a minimal output of greenhouse gas (GHG) emissions into the biosphere, specifically referring to the greenhouse gas carbon dioxide. A globally implemented LCE, therefore, is proposed as a means to avoid catastrophic climate change and as a precursor to a more advanced, zero-carbon society and renewable-energy economy. Duan Jin, vice dean of the Architectural College of Southeast China University: The achievement of a low-carbon concept consists of the following several parts. First, strictly reduce emissions of chemical raw materials, as green energy supply depends on renewable resources, such as solar energy and biomass energy. Second, design energy and environment controlling centers to ensure efficiency in the process of energy transition and distribution. Third, create a low-carbon working and living lifestyle by providing multi-choice public transportation and promoting greener transportation alternatives such as bicycles, electric motor cars, track traffic lines and walking. Fourth, plan a multi-level integrated forestation system to supplement traditional surficial forestation. Finally, establish a low-carbon construction standard to monitor the processes of design and construction. Richard A. Wilson from SOM (first-prize design): According to our chief planner Philip Enquist's design, four energy centers assure an intelligent city infrastructure system in the new CBD; every building does not need its own energy supply system anymore. This way, you could reduce the energy required for CBD by 50 percent. Water is very precious in Beijing, so we believe this system would allow capturing rain water to be more efficient and reduce water consumption by 48 percent. Additionally, it has a series of small walkable streets, allowing the transit system to reduce the carbon footprint of the CBD by 50 percent. Thus, we can reduce CO2 emission by 215,000 tons a year, which equals the amount absorbed by 14 million trees. What are the highlights of the transportation system in the new CBD design? Wang Wei, deputy chief planner, Beijing Municipal Commission of Urban Planning: The most pragmatic design is the trolley loop which is promoted by several plans. Trolleys can link with the existing track traffic lines, assuring the efficiency of the transportation system. Meanwhile, a perfectly-designed pedestrian system is posed by several plans as well. This concept or way of thinking is highly recommended in the future design. Ke Huanzhang, evaluation group leader, general counsel of Beijing CBD plan, former president of the Beijing Municipal Institute of City Planning and Design: Although we promote the use of public transportation, bicycling and walking on foot, motor cars are still unavoidable. Confronting the parking issue, underground parking space will take 85 percent of the new CBD parking area, while overground parking positions will be mainly used for business visits. Richard A. Wilson from SOM (first-prize design): The transit system in the CBD cannot be achieved without a fully integrated transportation system. Beijing has already done a fantastic job to provide the system, including the designed subway line 14, bus rapid transit (BRT) of Chaoyang and regular bus routes everywhere. In addition, we propose two new projects. Within the CBD, we have a line to link all areas, making a loop in CBD. You could also add lines in other areas of the city. The other big opportunity for the city is to establish express services to the Beijing Capital Airport and South Railway Station. 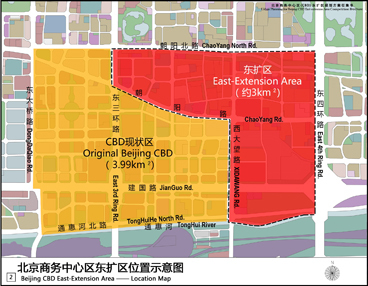 What is the future of Beijing CBD's expansion area? Based on a preliminary plan, a 3 sq. km area east to the present CBD is designated as the planned expansion region, while a 4 sq. km area north of it is planned as a control region. In the next ten years, it is estimated that the eastward expansion may absorb a total social investment of 70 billion yuan and offer more than 100,000 job positions.